According to a story circulating online which has been passed along in many churches, an ancient Jewish tradition held that when a person had finished their meal, the person would toss their napkin aside if he or she was finished. However, if the person had to leave and was not finished, the person would neatly fold their napkin and place it to the side of their plate indicating that he or she would return. Advocates of this story contend that the folding of the napkin in John 20:7 was Jesus' way of saying that he was going to leave but would soon return. While the story is heartwarming, one must ask if there any merit to the claim. After investigating the story, unfortunately, I must report that there seems to be no evidence that the story is true. But there is a more remarkable twist that is greater than the supposed tradition. First, here are the reasons why the story seems to be nothing more than an urban legend. 1. The body was clearly resurrected and not merely resuscitated. Something amazing must have taken place for the rolled head cloth to have been placed in a separate location than the other linens. For Jesus to have been able to escape the grave cloths without disturbing their form while at the same time rolling the cloth that had wrapped his head illustrates that Jesus experienced a greater and far different return to life than what Lazarus or anyone else ever had. Lazarus had to be unbound from the cloths that enclosed his body (Jn. 11:43-44). Jesus was able to return to life and leave behind the cloths without any assistance. Remarkable! 2. The body would have had to come through the cloths with the head wrapping. The other cloths were lying in the same place and the same form they had when they wrapped the body of Jesus. Yet, here was this head cloth rolled up to the side away from the other cloths. This seems to suggest that the body of Jesus came through the cloths with the head cloth attached. Thus, if a person were to witness the resurrection, it is likely that the eyewitness would see the body arising out from the cloths. Or, it could be that a person would see the body vanish with the cloths sinking in where the body had been with the visible Jesus standing beside them with headcloth in hand. After the resurrection, Jesus rolled up the cloth like a scroll and laid it to the side before exiting the tomb. The resurrection of Jesus was an otherworldly event unlike anything anyone had before perceived. When Jesus resurrected from the dead, God used a new system of physics for this event—one that linked the spiritual and physical in an amazing new union. 3. The body of Jesus was wrapped in more than one cloth. While the Shroud of Turin’s authenticity is not necessary to believe in the resurrection of Jesus, some have used the cloths mentioned in John’s Gospel to refute the Shroud. This is not a good practice primarily because John notes the existence of more than one kind of cloth. Since the women were not able to fully embalm the body of Jesus, it is possible that a Shroud covered the body of Jesus along with other wrappings in the tomb. The head cloth and the other linens indicate the plurality of cloths used to bury Jesus’ body. The absence of evidence pertaining to the Shroud is not evidence of absence. So, while the story of an ancient Jewish tradition linking the folded head cloth with Jesus’ return is most likely an urban legend, the actual story of the wrapped head cloth tells a greater story. Jesus’ resurrection was a spectacular and ethereal event. 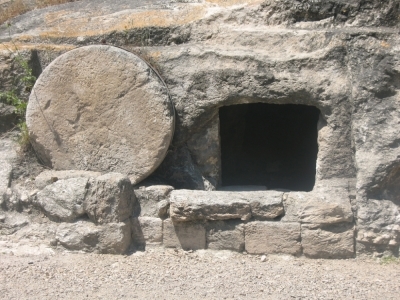 The power exhibited by the resurrection is greater than any power known to humankind. Paul notes that just as Jesus has risen from the dead, so shall all of those who have trusted Christ (1 Co. 15:23). This indicates that this kind of resurrection will one day be coming to a tomb near you.